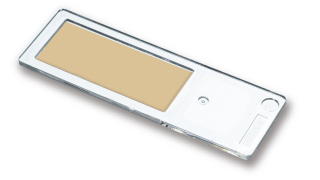 Microbial Preservation Plates-Preserve microbial strains ALIVE ! 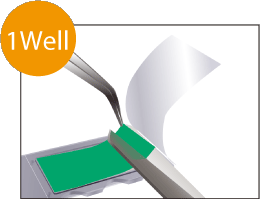 Microbial strains such as E.coli and yeast can be dry-preserved on a paper chip coated with a preservation agent. 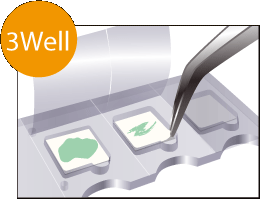 Samples can be sealed individually with an accessory protection seal to prevent contamination and inactivation. This enables compact and efficient preservation at normal room temperature - it is no longer necessary to use deep freeze or dry ice for transportation. Note : When handling the specific pathogens, please act in accordance with the applicable laws and regulations in your county. ①Let the paper chip absorb a liquid sample. * Protective agent is spread on paper chips and it may appear as dot pattern but it does not affect the qualities. *Reduced pressure drying is recommended. * Insufficient drying may result in faulty performance. ③Seal the plate with the protection seal and store it in room temperature. * Make sure that the film is tightly applied. Loose sealing may cause contamination. ①Peel off the protection seal and place the paper chip into a container. Cut out the necessary size of paper chip. Pick up the paper chip from tweezer hole. Push the paper chips by tweezers etc. ②Put the solution into the container and stir. 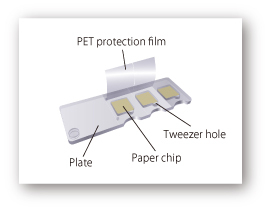 In the case of agar, rub the paper chip onto agar. 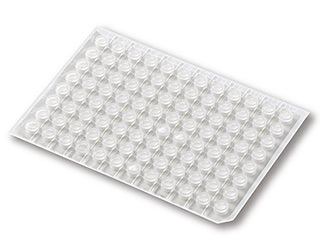 Matches your PCR plate's wells. The shape to take out easily with tweezers. Correlationship between preservation time and storage temperature? Please store at the lower temperature for longer preservation. Some samples can be stored at the normal temperature if it is for short period. Please see our lab data for your reference. What is the shelf life of the products before unsealing and use? 1 year after the manufacturing date. Can I store the unsealed product ? Please do not store the unsealed product without using it. Sterile condition is lost once it is unsealed. Please unseal the products in a clean bench or a safety cabinet just before the use. 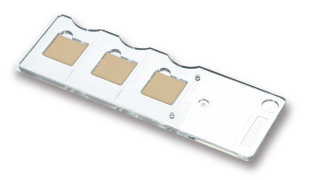 Is it better to store the plates at -80℃ rather than -20℃ ? Please avoid storing the products at lower than -20℃. The protection seal may not function under the temperature lower than -20℃. What is the recommended method for storing plates ? Bundle 2 plates with a rubber band so that protection seals face to each other and place it in a ziplock bag. 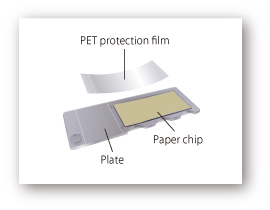 This prevents the PET film from rubbing and getting damaged by another plate. Preservation Plate has been developed from the study reslut of MEXT's Intellectual Cluster Formation Project <Tokushima Region Noji group (The University of Tokushima)>. 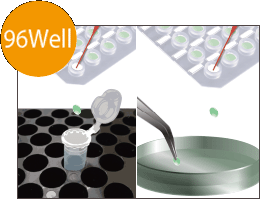 The verification experiments have been implemented under advice of Dr. A. Yokota and Dr. M. Kurahashi of Institute of Cellular and Molecular Biosciences, the university of Tokyo. This project is supported by METI's New Cooperation Measure Subsidy.